272 pages | 1 B/W Illus. Timothy Smiley has made ground-breaking contributions to modal logic, free logic, multiple-conclusion logic, and plural logic. He has illuminated Aristotle’s syllogistic, the ideas of logical form and consequence, and the distinction between assertion and rejection, and has worked to debunk the theory of descriptions. 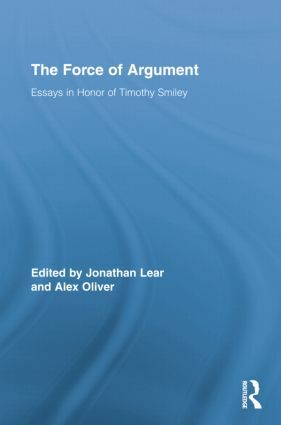 This volume brings together new articles by an international roster of leading logicians and philosophers in order to honour Smiley’s work. Their essays will be of significant interest to those working across the logical spectrum—in philosophy of language, philosophical and mathematical logic, and philosophy of mathematics. Alex Oliver is Reader in Philosophy at Cambridge University and a Fellow of Gonville and Caius College, UK. Jonathan Lear is the John U. Nef Distinguished Service Professor at the Committee on Social Thought and in the Department of Philosophy at the University of Chicago, USA.